Bubba Watson is one of the few left-handed golfers on tour and is known for his big hitting. In 2007, he had an average drive of over 315 yards and was capable of generating a ball speed just short of 200 mph. In 2012 he won the US Masters by defeating Louis Oosthuizen in a playoff, a victory that propelled him to fourth place in the Official World Rankings. Watson started his professional career on the Nationwide Tour, qualifying for the 2005 PGA Tour. His massive driving soon attracted the interest of the media, leading the PGA Tour in driving distance after recording a 422-yard drive on the Nationwide Tour. Watson gave a hint of what was to come when finishing tied for 5th at the 2007 US Open at Oakmont. 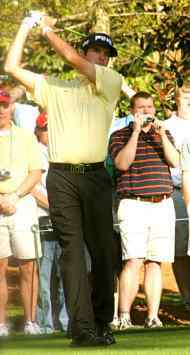 He did not manage his first tour victory until June 2010 when defeating Corey Pavin and Scott Verplank in a sudden-death playoff for the Travelers Championship. He almost claimed his first major later that year when losing in a playoff to Martin Kaymer at the PGA Championship at Whistling Straits. He birdied the first playoff hole but Kaymer hit back at the second with Watson’s hopes finally sinking at the water hazard on the third. In January 2011, Watson won his second PGA Tour event, the Farmers Insurance Open, defeating Phil Mickelson by one stroke. He followed up in May when he beat Webb Simpson at the second playoff hole for the Zurich Classic of New Orleans. After both players had birdied the first hole, Watson hit the decisive putt for a birdie on the second to clinch victory. Watson did not have to wait too long to atone for his playoff defeat at the 2010 PGA and secured a first major triumph in the 2012 Masters at Augusta. He was three shots off the pace going into the final round and produced four consecutive birdies in a round of 68 to tie the clubhouse lead. In a sudden-death playoff with South African Louis Oosthuizen, both players struggled on the second with a par eventually proving good enough to give Watson the victory. The win elevated him to a career-best fourth in the Official World Rankings. Remarkably, three of Watson’s four career wins have come in playoffs. His only playoff defeat came in the 2010 PGA, giving him the credentials to make a formidable opponent in match play. He has yet to transfer this kind of form to the Ryder Cup in two appearances. In his rookie year in 2010, he was beaten in three of his four matches including the singles. In the 2012 Ryder Cup at Medinah, Watson won two of his three matches when paired with Webb Simpson but crucially lost his singles match 2 & 1 against Luke Donald. Watson began 2013 with a promising effort, finishing tied for fourth at the Hyundai Tournament of Champions at Kapalua. He subsequently withdrew from the Farmers Insurance Open suffering from a bout of flu.